The combination of returning home from two weeks away, unpacking and thinking more and more about our upcoming move has left me feeling very frazzled this week. It's like I keep thinking of more things that need to be done (which isn't so much a feeling as it is a reality). I haven't knit for days (THE HORROR!!) and I'm not sure if I will before I go to bed tonight. Just depends on what I manage to get accomplished between now and then. However, thanks to my sister, I do have a fantastic deep red Franklin Covey Planner and I am putting it to good use. She is very involved with FC and was able to explain a lot of the concepts during our time together. So far, so good. 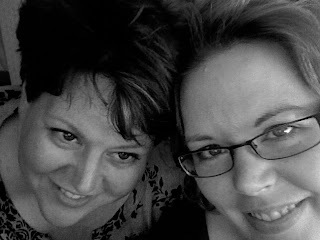 Speaking of our time together, my sister and I had a long weekend getaway in Chicago while I was visiting my parents. It was fantastic! We shopped, we ate, we rested and perhaps most impressive of all, we saw Wicked. It was everything I wanted it to be and then some. If you can go, GO. I'll leave you with a picture of my sister and me. Pardon my big ol' forehead.